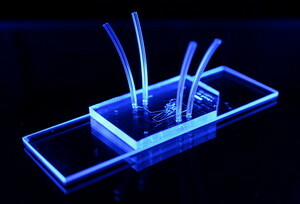 HUNTSVILLE, AL--(Marketwired - Dec 4, 2013) - CFD Research Corporation developed SynVivo® microfluidic cell-based assay platform has been recognized as one of the "Top 10 Innovations of 2013" by The Scientist magazine. SynVivo enables faster, more efficient drug development by combining the control of in vitro testing with the realism of in vivo studies. The Scientist gathered expert judges to evaluate laboratory and research products introduced in the past year that are poised to revolutionize the life sciences. The judges noted that SynVivo "can recreate realistic human microvascular networks within which cells of interest can be cultured and studied in a more realistic setting." They also remarked that the platform is "the next step in microvascular microfluidic assay systems, enabling innovative cell-migration and drug-distribution assays that are difficult to model in other ways." "The problem our pharmaceutical and academic customers face today is that current in vitro models are often limiting, because they do not truly represent human physiology and biology," said Richard Thoms, product manager. "There is strong interest from researchers to work with human/animal cells in a more in vivo relevant in vitro platform so that the effects of flow, shear and morphology can be studied. SynVivo assays meet those goals and are improving the efficiency and efficacy of drug discovery and safety testing." "I realized there was a need for more realistic in vitro systems to study adhesion mediated processes," said Prabhakar Pandian, Ph.D., lead developer of SynVivo. "It has been a rewarding journey to develop the technology from a research idea to a commercial product, but perhaps I'm more excited by what the future holds." "We are thrilled to have SynVivo recognized by The Scientist," said Kapil Pant, Ph.D., director of biomedical technology at CFDRC. "Our SynVivo product line is expanding rapidly with the addition of 3D co-culture constructs for tumor models, customized organ-on-chip constructs and application specific assays modeling the blood-brain barrier." Click here to read the full article in The Scientist. CFDRC will be exhibiting SynVivo at the upcoming 2013 American Society of Cell Biology Annual Meeting in New Orleans December 15th-17th. SynVivo® is a physiological, cell-based microchip platform that provides a morphologically and biologically realistic microenvironment allowing real-time study of cellular behavior and drug delivery. Additional information can be found by visiting synvivo.cfdrc.com.